Ray & Janie are ready to help you protect your home from heat and glare – contact them today! Removable Solar Inserts and roll-up Solar Shades in these windows allow light without the glare. Let us help you choose among the various options to best protect your home and possessions. Do your windows look ugly and unkempt with ill-fitting blinds? Clean up the view with beautiful, removable Solar Shade Inserts! This customer loved their film so much, we are going back to do the bottom windows! MaxPro-15 reduced the heat and the glare! Don’t let ugly blinds ruin the look of your beautiful home! The “after” photo after installing Removable Solar Inserts, plus a functioning solar shade in the middle. Wow! Removable Solar Inserts can be installed for the hot summer months, and then removed during the winter months. Removable Solar Inserts put in the top windows, plus matching motorized solar shades going in the lower windows! You paid for the view – don’t hide it behind curtains or blinds! Ask us about the right window film to reduce glare and heat. Commercial and retail spaces can save on heating and cooling costs by using the right window film. We can paint the trim of our Removable Solar Inserts to match your decor. No matter the size or shape of your windows, we can find the right product to help you preserve your furnishings. Maintain the heat in the winter months with window film that reduces the glare and takes out 99.9% of the damaging UV. A beautiful mountain cabin that’s protected with window film. Unique windows are our specialty! We take pride in our workmanship and ensure the best installation for you. Notice the small window on the left where window film has NOT yet been installed. Whether you have a traditional home or a cabin, window tint can help protect your investment. Windows with film are on the right; no film on the left. Building your dream home? We’d be happy to work with your contractor to create a home that is as comfortable and energy efficient as it is beautiful! Whether you have a cabin or a traditional home, window tint can help protect your investment. The office building “before” window tint installed. A look at the after photo of a business building. The window film allows for privacy as seen from the outside. Today’s homes use more glass than ever before. Removable Solar Shades offer the best of both worlds. We can install window film just about anywhere there’s a window! Ask us about tinting those windows that you can’t easily reach to put blinds on. We can add specialized privacy film to door and window areas. Make beautiful entrances more attractive with specialty window films! Great views are guaranteed with the right window film. 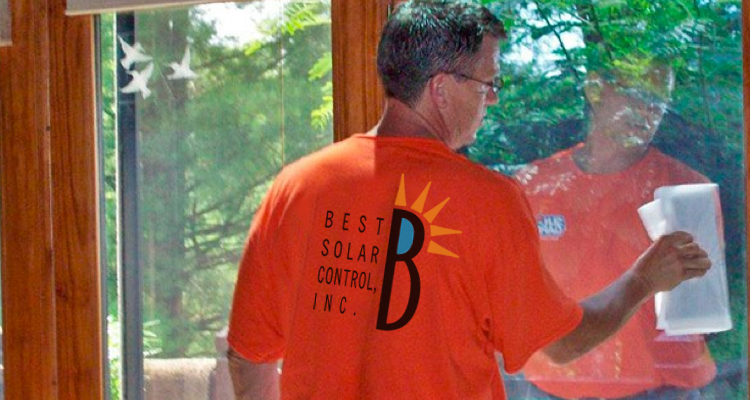 Call Best Solar Control today and start protecting your furniture — and your views! Perfect for architectural windows! Solar Inserts will maintain your view using translucent shade material available in a variety of colors and offering maximum UV protection.